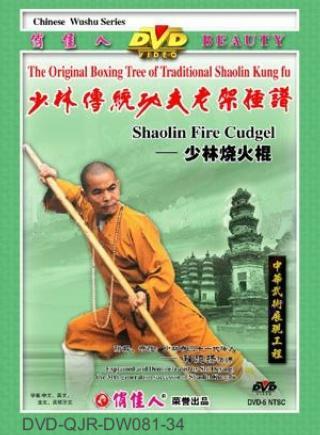 Shaolin Fire Staff (Shaolin Shaohuo Gun) belongs to the Shaolin long weapon series. This is one of the most representative routines among Shaolin wushu and is very frequently seen. It is said that this staff routine was created by Jin Na-luo, who is a kitchen fire tendering monk of Shaolin Temple and thus named after him. This routine features an extended and decent form with interleaving fast and slow motion. It composes hardness and suppleness with the staff going in the way of a dragon and a snake. Attack and defense are integrated as a whole with unique foot steps. The main movements include beat, point, sweep, hang, move, thrust, swing, hatch and so on. Practise it persistently and you will gain better body harmony and a stronger constitution.